Salman Khan chills with his sister Arpita Khan and his nephew Ahil. Salman Khan loves spending time with his nephew Ahil and sister Arpita Khan and Arpita’s Instagram feed proves it all. 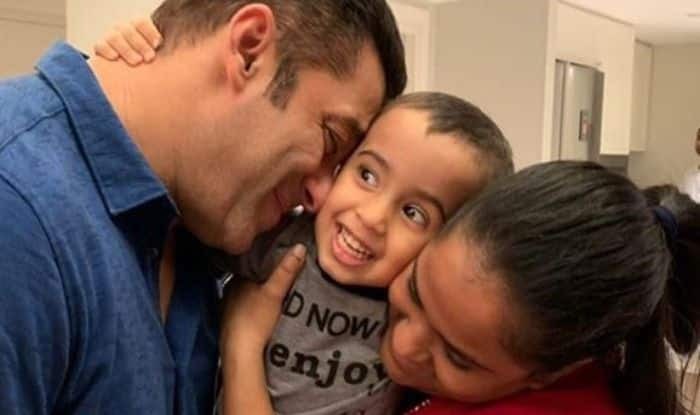 Arpita, who is very active on social media, keeps sharing pictures of her son Ahil with Salman, her husband Aayush Sharma and her father Salim Khan. Recently, Arpita shared an adorable picture of herself with Salman and Ahil which is just too cute to handle. Arpita took the picture to her Instagram and captioned it, “My life in one frame My brother & My son. Thank you god for the choicest blessing .” In the picture, Salman and Arpita could be seen cuddling Ahil. Salman closed his eyes and smirked as he gave his nephew a peck on his cheeks. Ahil smiled as he wrapped his mother and uncle in his arms. Last month, Arpita shared a video where Ahil’s grandfather and Salman and Arpita’s father Salim was seen giving Ahil a back ride while Salman held on to the little one. The video soon went viral and was shared by several fan accounts of Salman on Instagram. On the professional front, Salman has wrapped up the shooting for his film Bharat which also stars Katrina Kaif, Disha Patani, Jackie Shroff, Tabu and Sunil Grover in pivotal roles. He will reportedly start shooting for the third part of Dabangg in March-April. The film will also star Sonakshi, Arbaaz Khan, and Mouni Roy. Sonakshi and Salman are all set to share screen space after seven years with Dabangg 3. The makers of the film had earlier revealed that the film will actually be a prequel.